As soon as you bring the new pet home, give it its own private space, like a bedroom or office. Set them up with a bed, food, water and toys; give cats litter boxes, and walk new and old dogs separately. A new pet is a big change for everyone, and keeping them separate allows them to process. Just as important, it lets you have one-on-one time with new AND old pets. Don’t be surprised if resident pets seem especially eager for attention: they smell someone new on their “turf” and may need reassurance that you still love them as much as ever. Speaking of which, smell is the primary way pets communicate. When the new and current pets both seem to have adjusted—cats are no longer in hiding and dogs have mellowed out a bit—gradually introduce them to each other’s scent. If you’re introducing two cats, swap their beds, or rub blankets on their cheeks — a powerful hormone receptor — and swap those. If you’re introducing two dogs, put them each on a leash, bring them together in a “neutral” place (like the sidewalk), and let them get a good sniff for a few seconds, then separate them and give them both treats to keep the energy calm. For any introduction, especially between a cat and a dog, leave the door to the new pet’s space closed so the pets smell and hear each other from opposite sides. Wait until both seem fully comfortable with this set-up. Then, replace the closed door with a baby gate and repeat the process so that they can also see each other. You’ll know when they’re ready to officially meet: they’ll both act interested and curious! 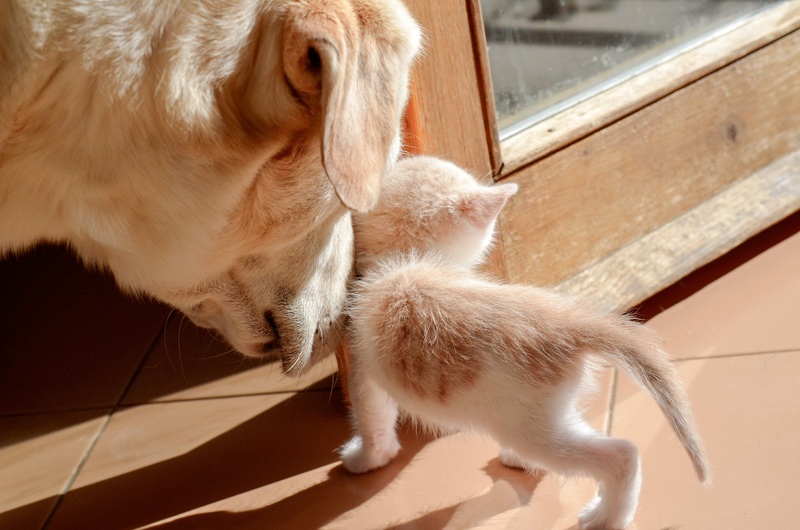 Kittens and puppies tend to accept these situations more readily and quickly than animals that are older, but with time, space, and plenty of individualized attention, you can successfully introduce younger and older pets. No matter what, follow their lead and be patient—sometimes pets adapt to each other within a day or two, and other times it can take a few weeks. Letting them take their time instills their trust in you and, ultimately, in each other.